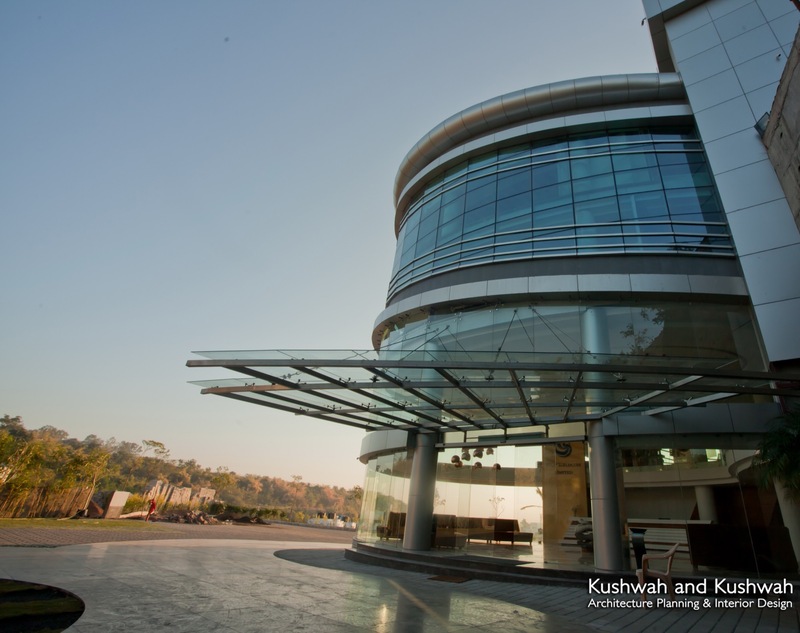 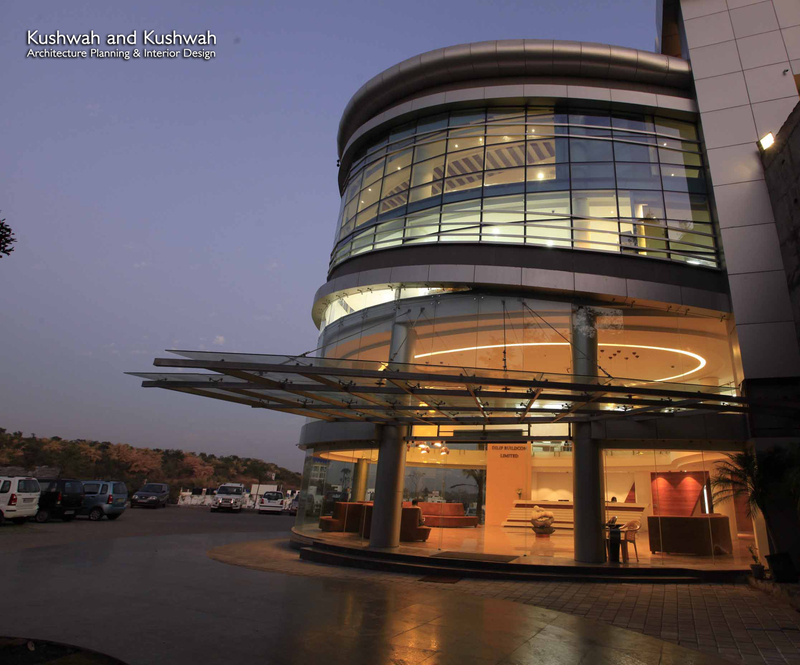 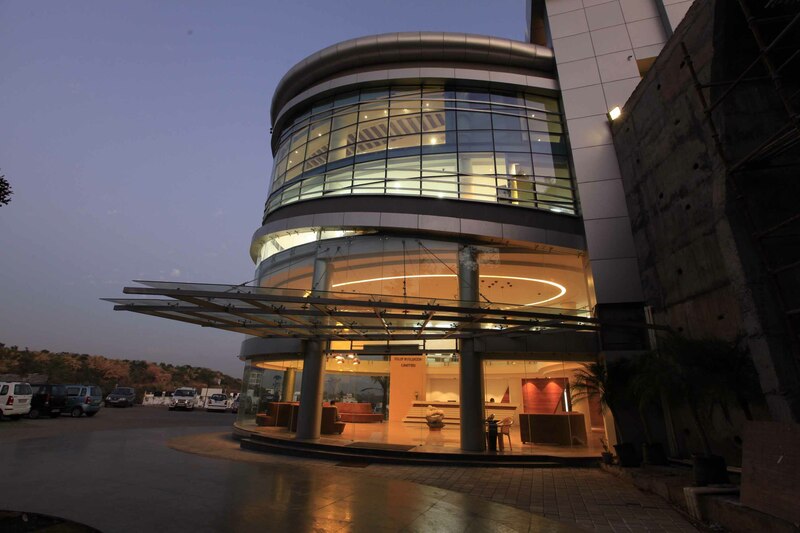 Dilip Buildcon Center, at Bhopal Madhya Pradesh, by Kushwah and Kushwah Architects - ArchitectureLive! 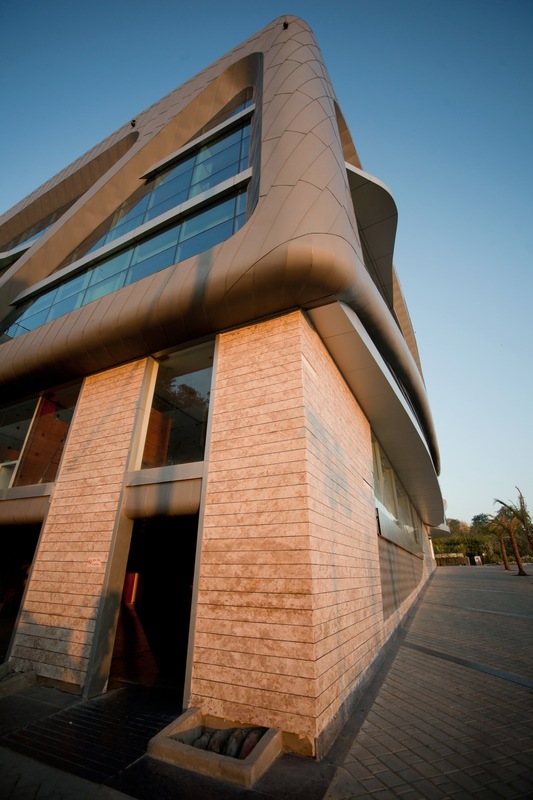 Since the height of building was restricted by existing bye-laws, post tensioned slabs were used in the structure to maximize the usable height. 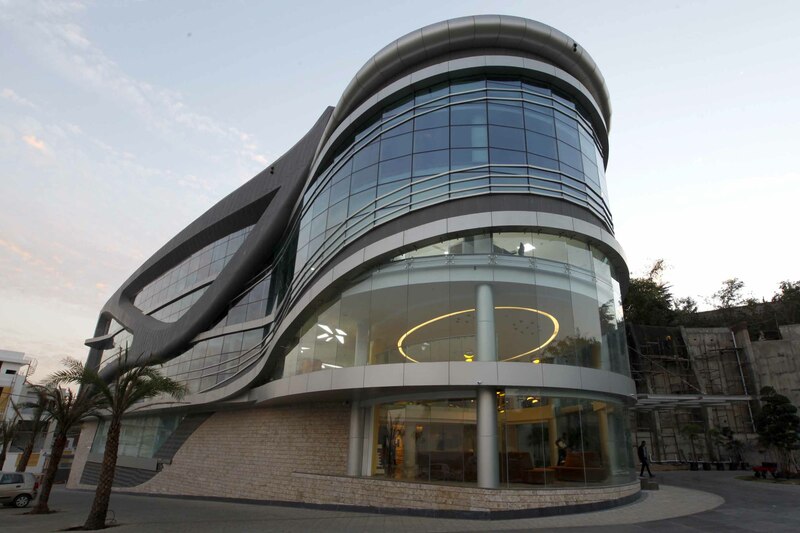 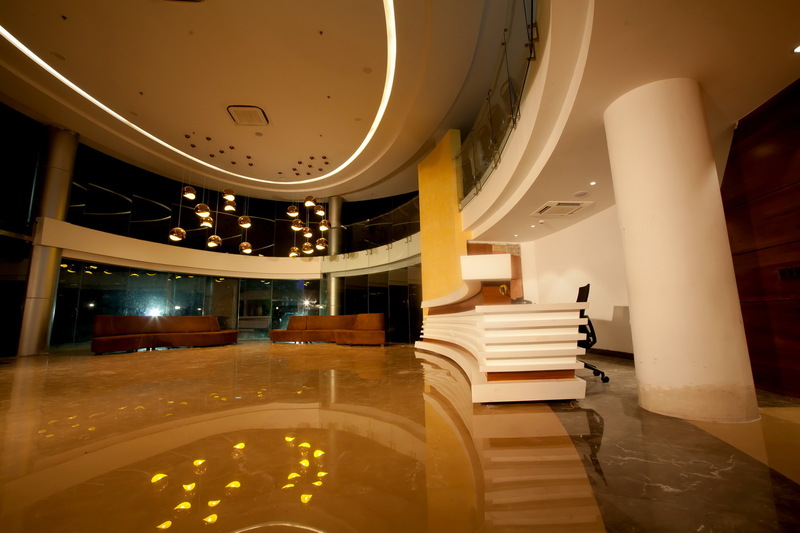 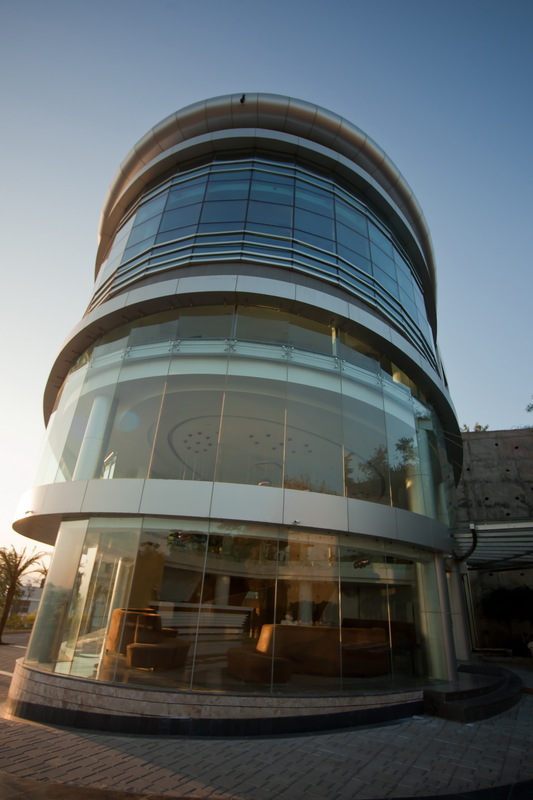 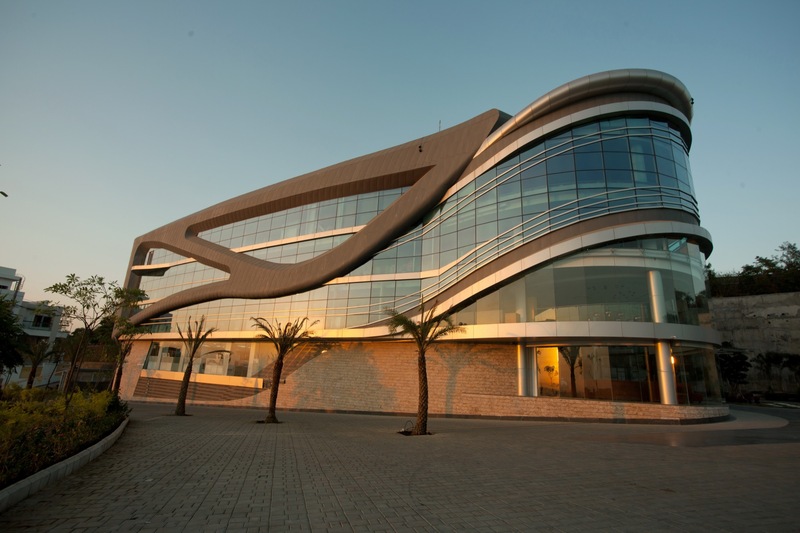 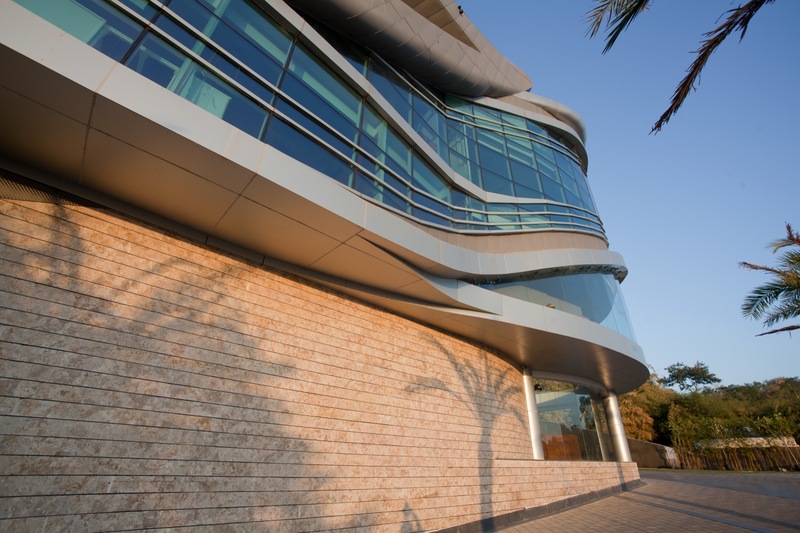 The building form draws its inspiration from undulating terrain of Bhopal city in general and the site in particular. 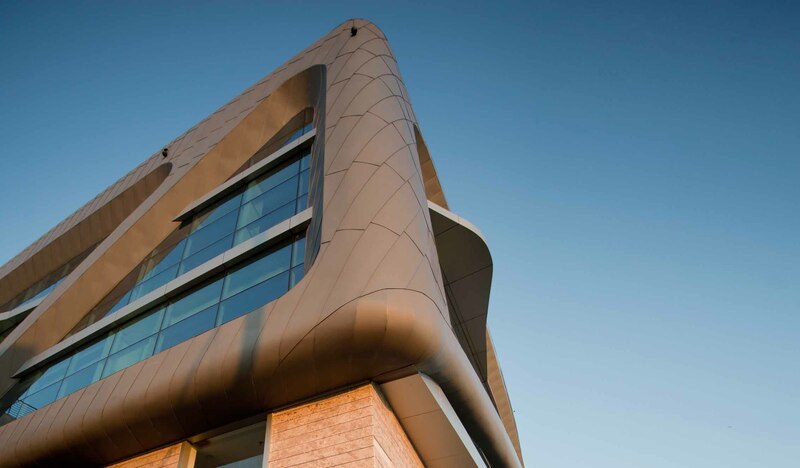 The façade is a rich tapestry of double glass unit mixed with interlocking zinc strips, perforated zinc Jaalis and aluminium trims interwoven in a fluid composition. 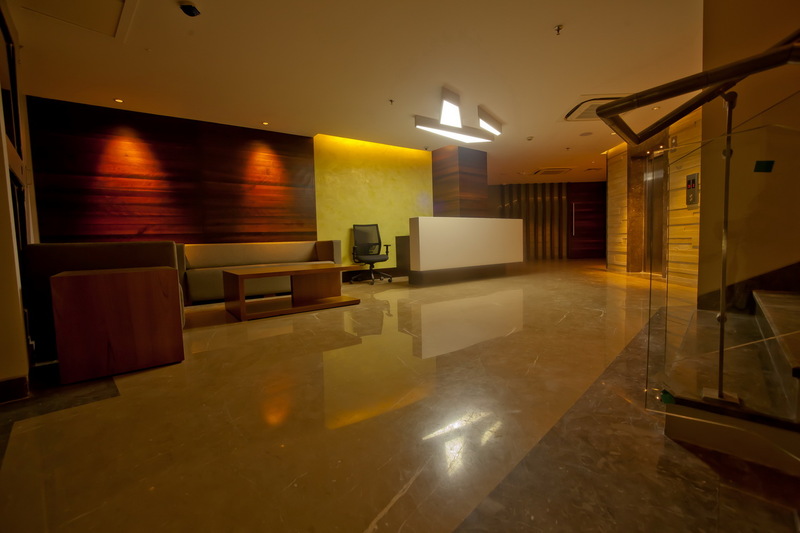 Driven by DBL’s modern ethos of efficiency and quality, the building has an understated finesse that makes it a noteworthy icon for the organization. 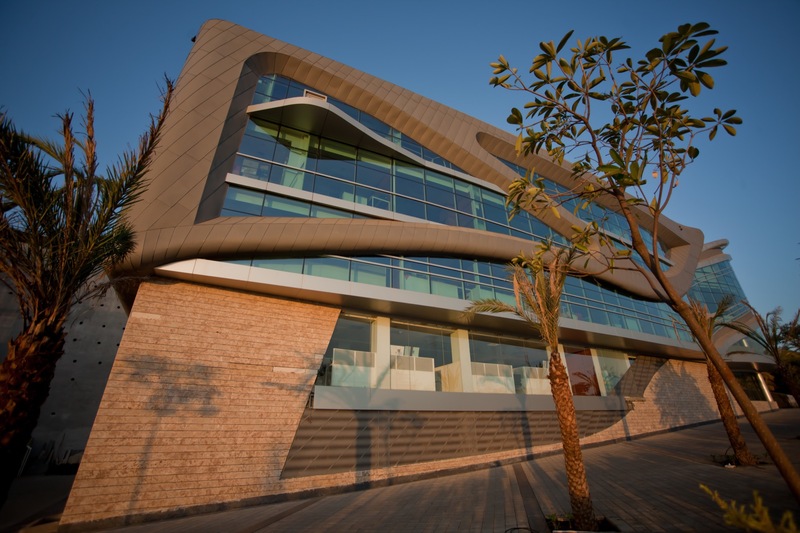 The fluid architecture of the building is quite unique. 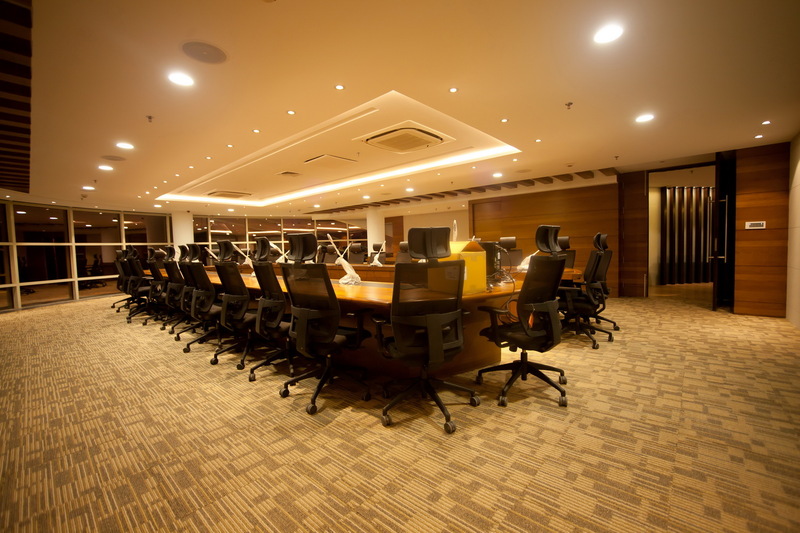 The program which is spanned over 4 storeys contains diverse spaces like various Conference and meeting rooms, open workstations, board rooms, Directors Suite, pantry etc. 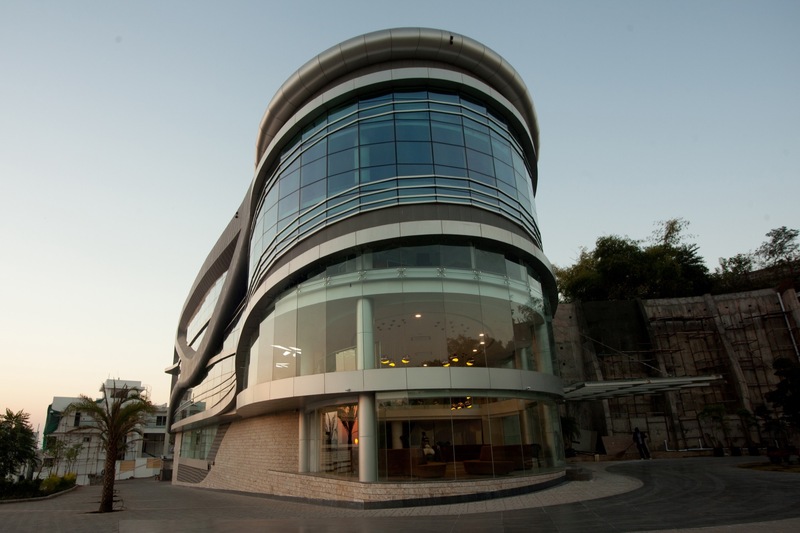 Interestingly, the architect has designed the roof as the most informal space of the office, where one can eat, relax and enjoy the view of the city. 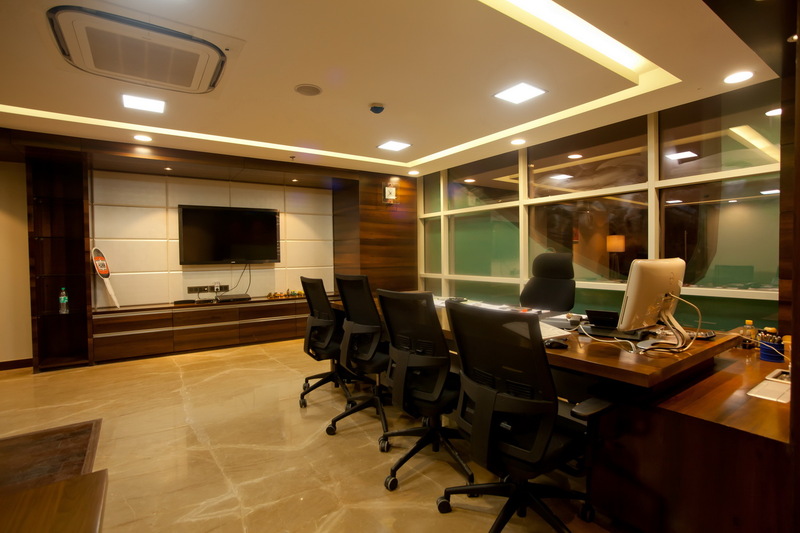 The DBL Office is a balance of formal and informal spaces flowing into each other and creating a functional and user friendly work environment. 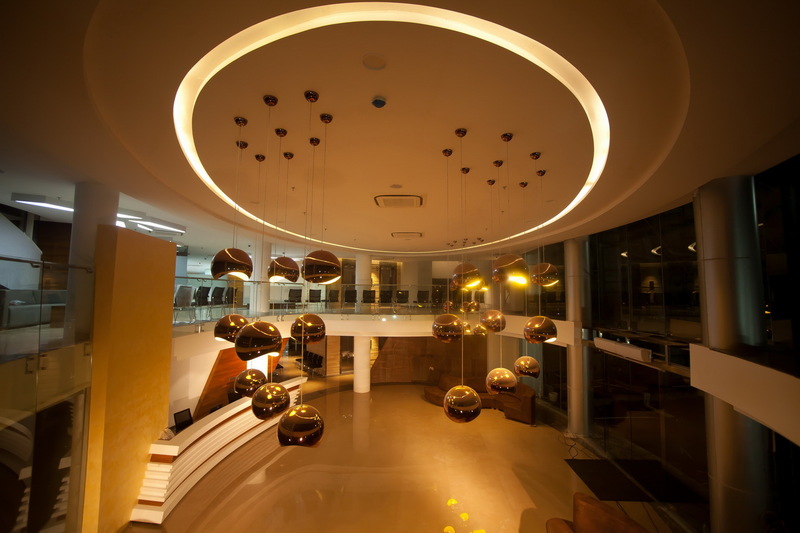 While designing the interiors, the idea was that the story of a space is just as essential as the design and the objects that go into it. 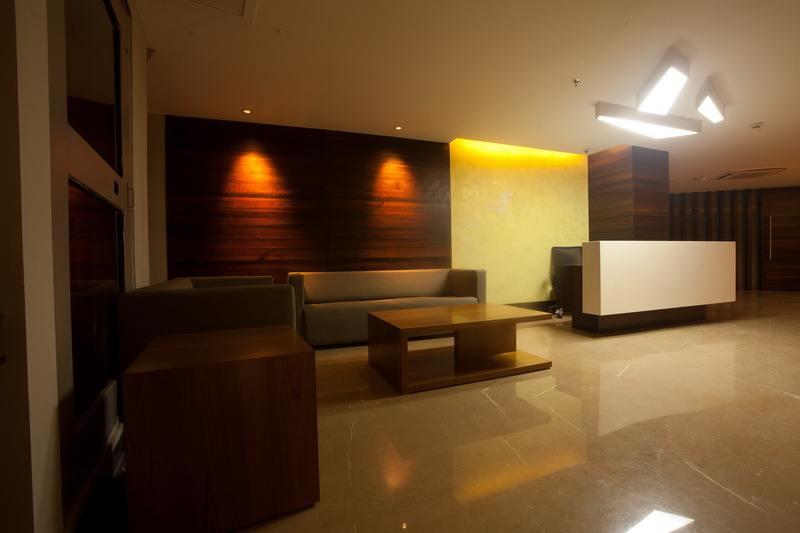 It all plays into the comprehensive experience, which has been portrayed in the design. 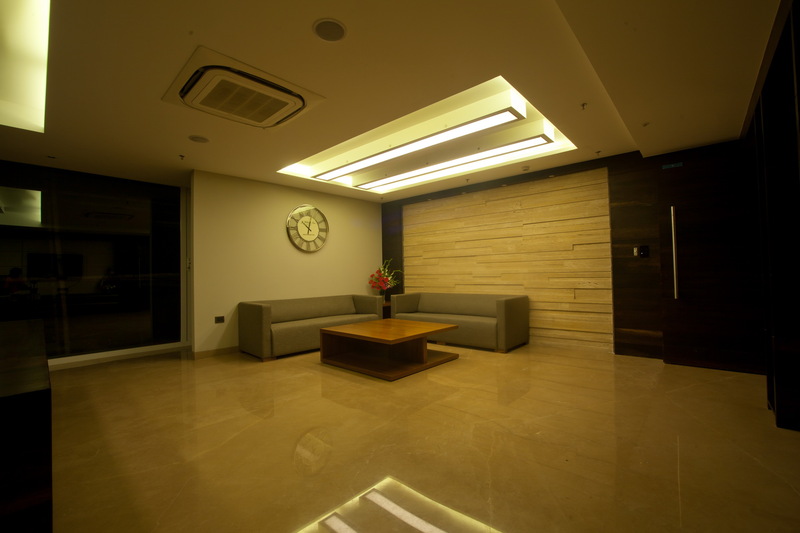 The minimalistic interiors of the project are done in subtle and earthy tone. 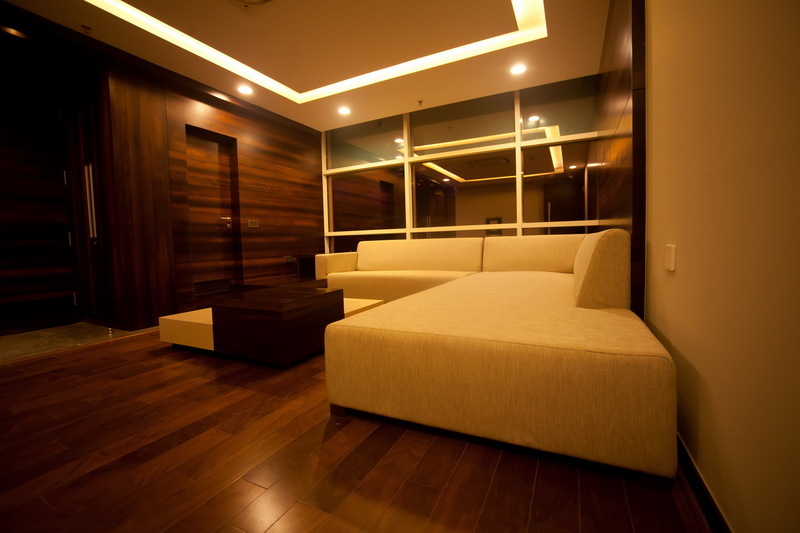 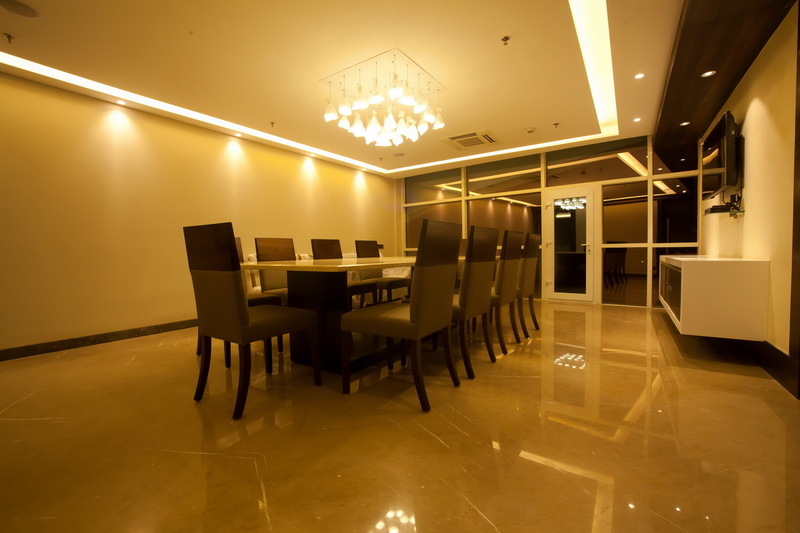 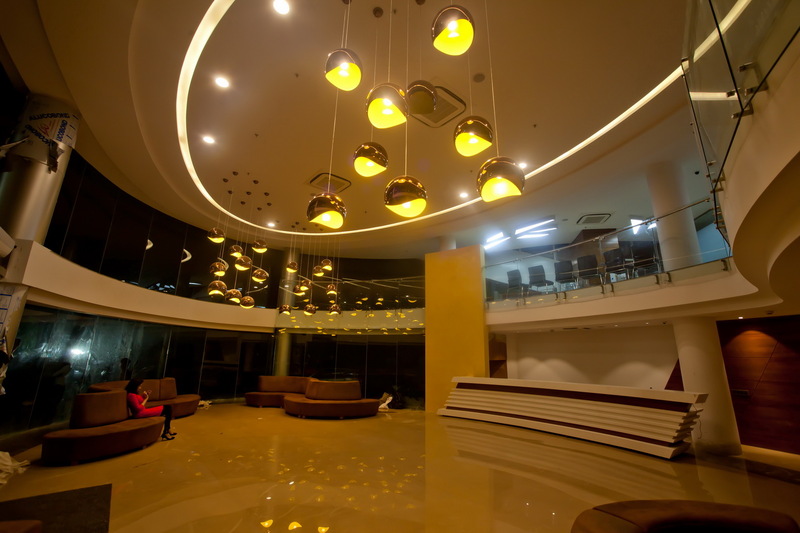 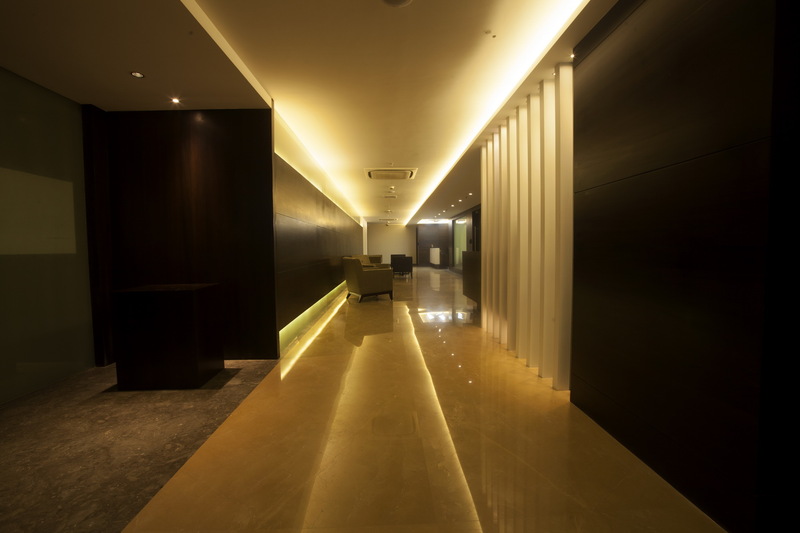 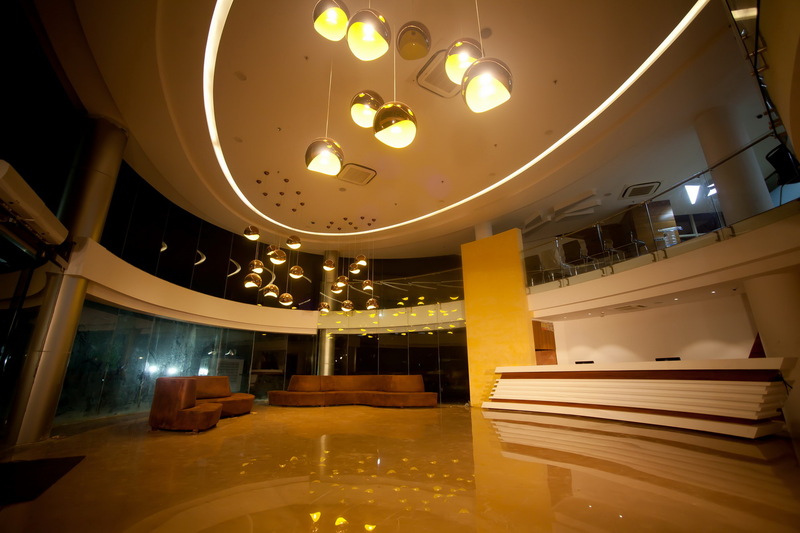 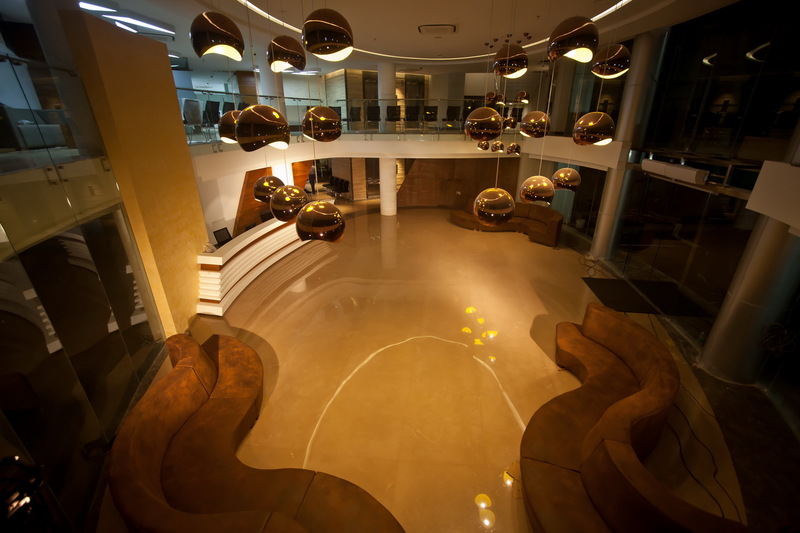 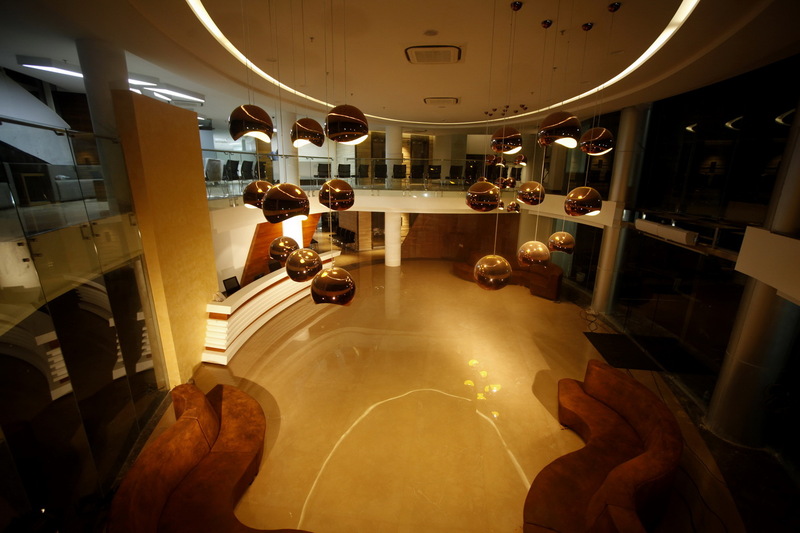 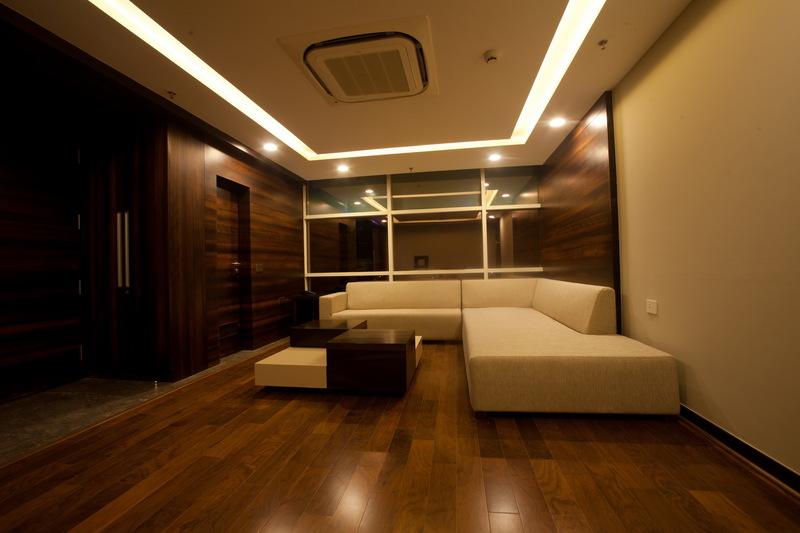 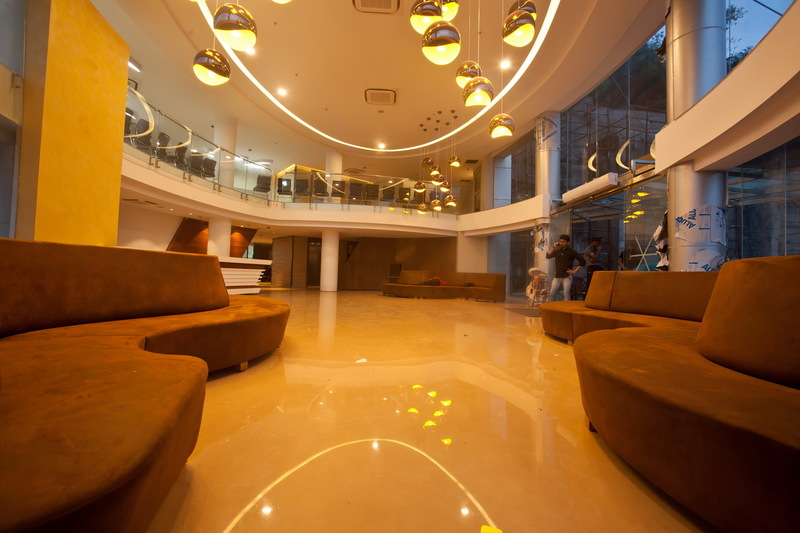 Components like flooring, lighting, ceiling etc are adding to the unique ambiance of the space. 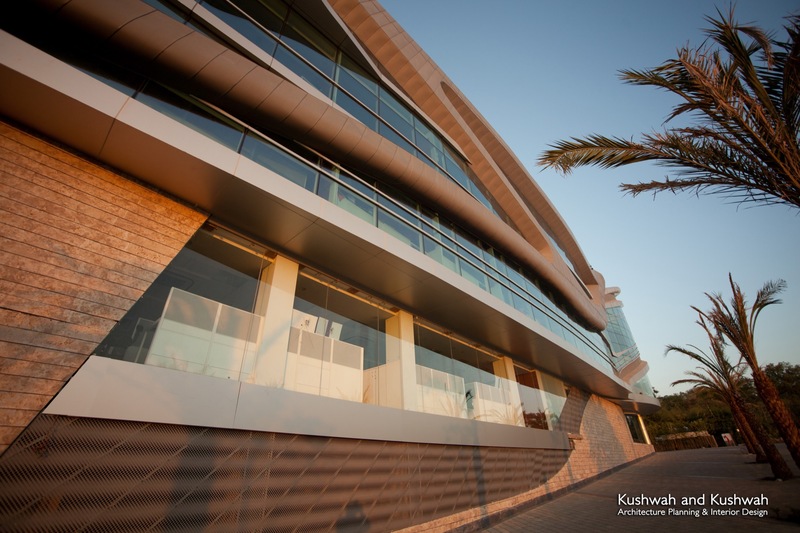 The indoor air quality of the building is enhanced by the central HVAC system, perforated fenestration facilitating daylight and efficient services.